Use this form for eligibility to exhibit at County, State, and Interstate Shows. 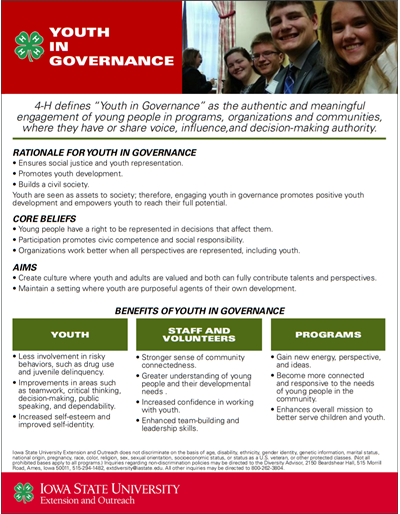 Youth in governance is the authentic and meaningful engagement of young people in programs, organizations, and communities, where they have or share voice, influence, and decision-making authority. 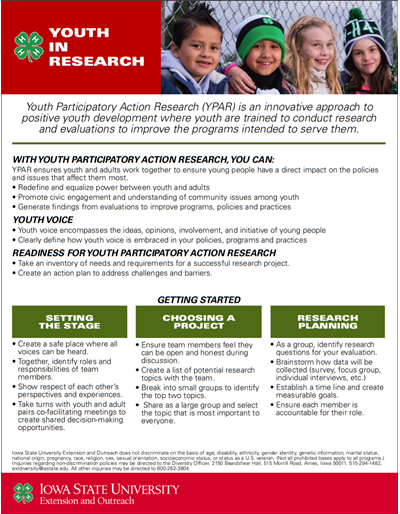 Youth Participatory Action Research (YPAR) is an innovative approach to positive youth development where youth are trained to conduct research and evaluations to improve the programs intended to serve them. 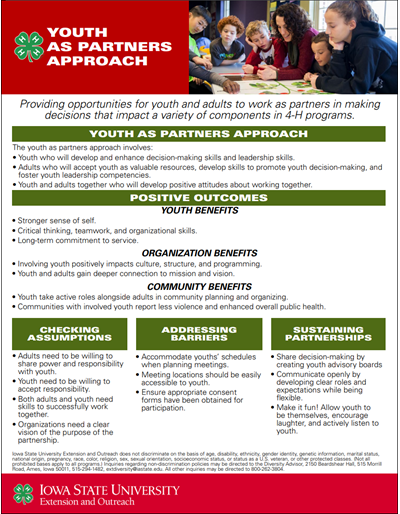 Providing opportunities for youth and adults to work as partners in making decisions that impact a variety of components in 4-H programs. External parasites such as fleas, ticks, lice and mites are a concern for both commercial and small flock poultry producers. 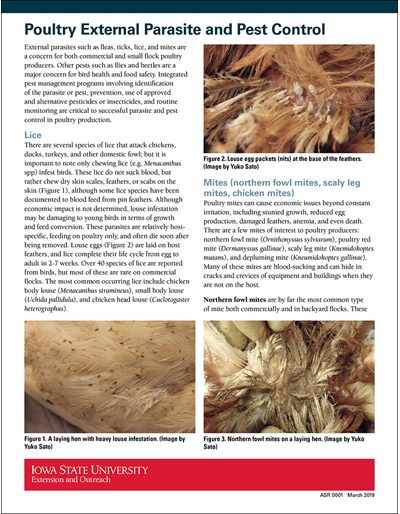 This publication discusses these type of poultry parasites and provides information, including a list of insecticides, that can be used to combat them. Available from the Crop Protection Network. The Iowa Crop Performance Tests for corn is conducted each year to help farmers select the best hybrids for their production conditions. 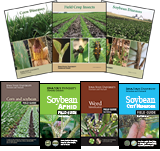 All six Corn Districts are now conveniently combined into one publication. Results of soybean yield trials that are conducted annually by ISU and the Iowa Crop Improvement Association. Provides information farmers need to select the best varieties or brands for their production conditions. This publication provides soybean aphid treatment recommendations and application rates, based on research conducted at two northern Iowa research farms in 2018. 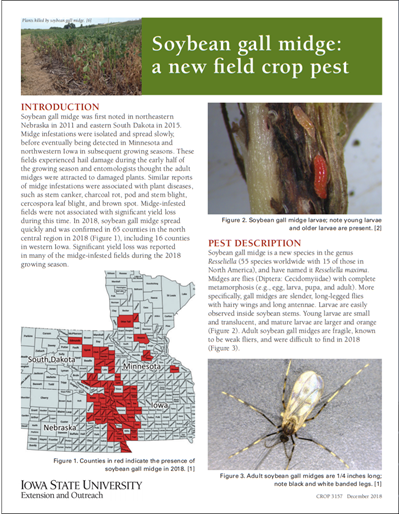 In addition to treatment techniques, the publication also contains information about the soybean aphid life cycle, scouting advice and a statewide summary for 2018. Introducing new specialty crops that complement corn, soybean and cover crops can help improve soil health and provide enhanced long-term productivity and profitability. Green gram and black gram are examples of these specialty crops that are being tested at Iowa State University. 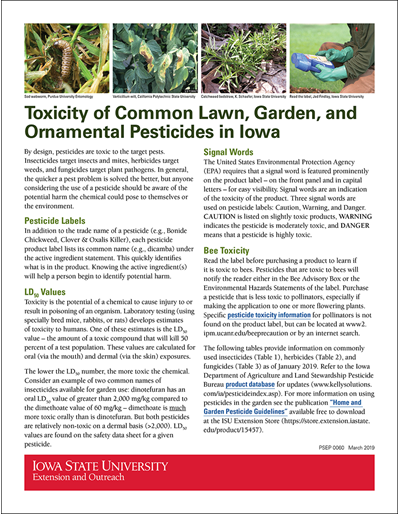 This publication provides information on the crop themselves, as well as current Iowa State research. 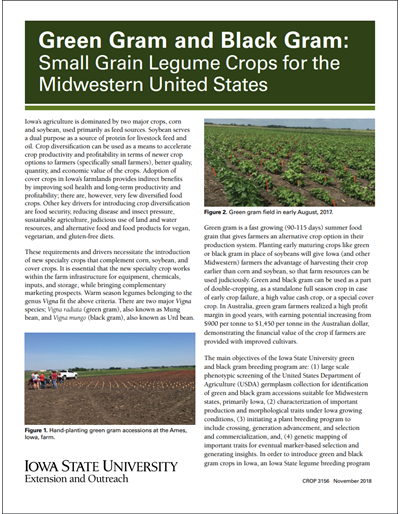 This publication is intended to provide a starting point for farmers who are new to cover crops. 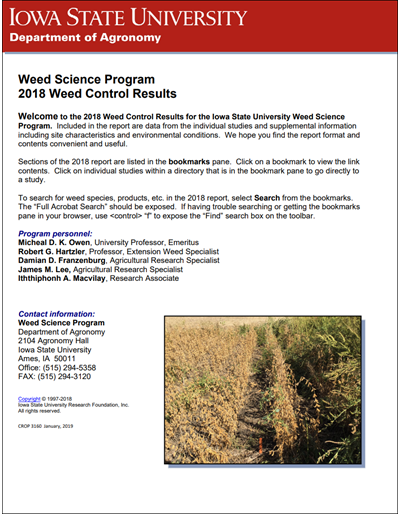 It provides information on integrating cereal rye into a corn-soybean rotation. This publication is intended to provide a starting point for farmers who are new to cover crops. It provides information on integrating oats into a corn-soybean rotation. 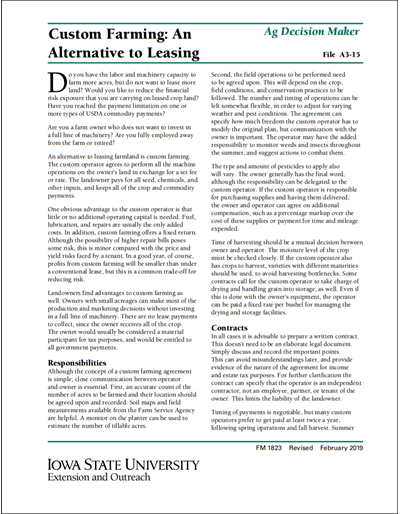 This publication describes the one-on-one farm financial computer analysis service available from ISU Extension to assist farm operators in assessing cash flow and profitability in a format often requested by lenders. This two-page sheet lists values of farm commodities at the end of calendar year 2018 for use in tax reporting. Iowa farmers who perform custom work, hire work done, or some of both, have the 2019 Iowa Farm Custom Rate Survey schedule as a guide in determining custom rates. 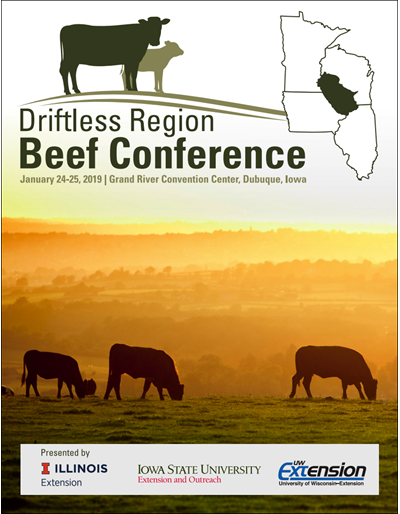 This information is based on a survey of 121 Iowa farmers, custom operators, and farm managers. For each operation, the average rate from the survey, the median and the range are shown. 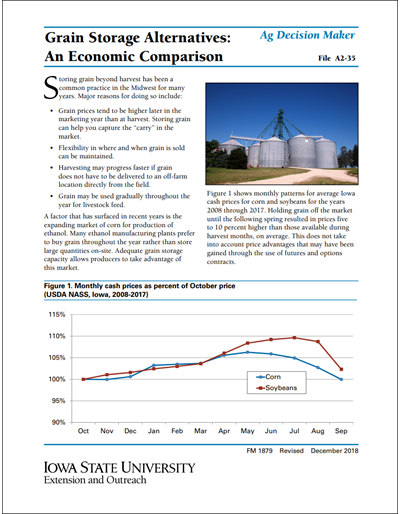 This publication estimates the cost of crop production in Iowa for 2019. Estimates for corn following corn, corn following soybeans, corn silage following corn, herbicide tolerant soybeans following corn, strip tillage corn and soybeans, non-herbicide tolerant soybeans following corn, low-till corn and soybeans, oats and hay production, alfalfa, grass pastures and machinery costs are all included. 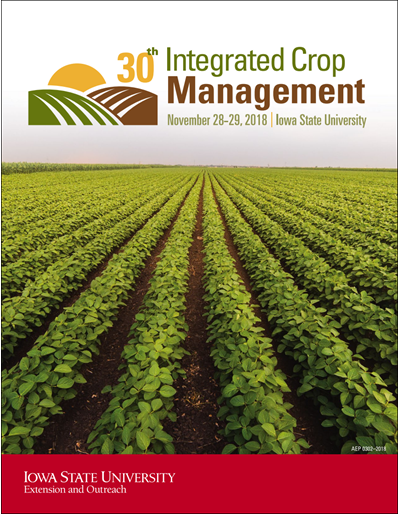 There is an Iowa State University Extension and Outreach farm and agribusiness management field specialist near you. Storing grain beyond harvest greatly increases the marketing opportunities available. Knowing the costs and benefits of different storage options helps producers determine the options that fit into their overall harvesting, handling and marketing system. Wineries in the United States must adhere to regulations when selling wine, including those regarding food safety. 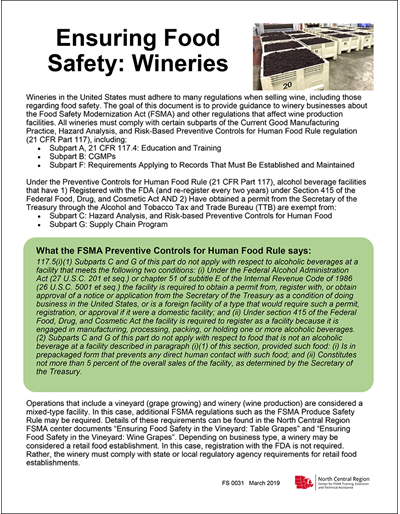 This publication provides guidance to winery businesses about the Food Safety Modernization Act (FSMA) and other regulations that affect wine production facilities. 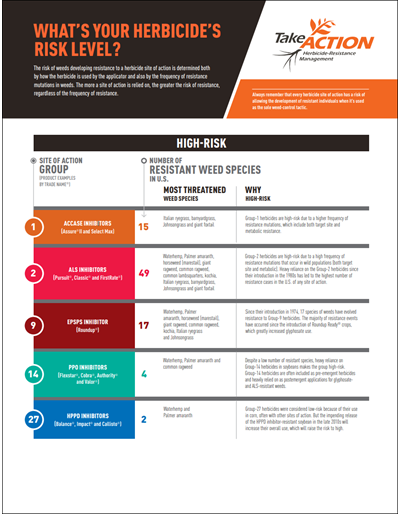 This guide provides weed identification and control information that turfgrass professionals can use to develop effective weed control programs for golf courses, athletic fields, sod farms, lawns, and other turfgrass systems. The recommendations apply to the majority of the United States, with input from experts in Illinois, Indiana, Iowa, Kansas, Kentucky, Michigan, Minnesota, Missouri, Nebraska, New York, Ohio, and Wisconsin. Fruit jams/preserves, fruit jellies, and fruit butters can be prepared at home and sold directly to the consumer in the state of Iowa by home based food operators in certain situations. 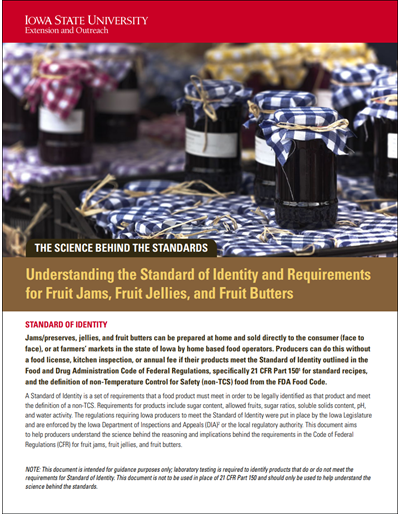 Learn about the Standard of Identity requirements products are subject to in the Food and Drug Administration Code of Federal Regulations and the definition of non-Temperature Control for Safety (non-TCS) food from the FDA Food Code. 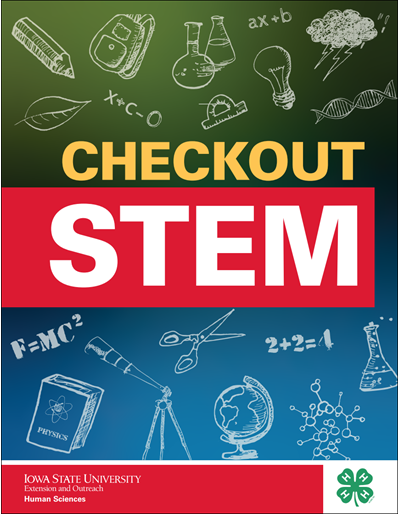 Activities and information about how to create checkout kits designed to support the development of literacy and STEM (science, technology, engineering, and math) experiences for K-3 children and their families. Seven activity guides focus on the following topics: Bee and Me, Curious Coding, Fabulous Five Senses, Super Slinky, Building Bridges, Humpty Dumpty, and Magic Eye. 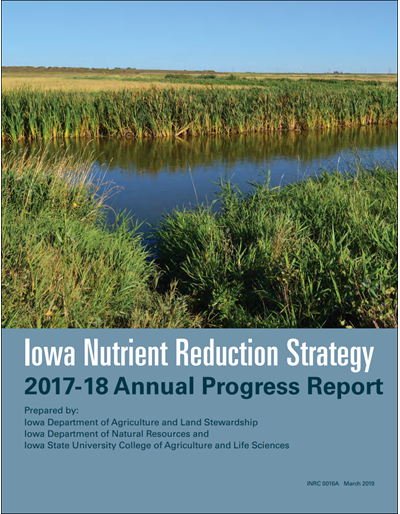 The Iowa Nutrient Reduction Strategy celebrated its five-year anniversary in spring 2018. In those five years, the initiative has evolved considerably, adapting as new knowledge, understanding, and challenges arose. This 2018 Annual Progress Report serves as the fifth overview of the progress that's been made in the complex work of reducing the loads of nitrogen and phosphorus that Iowa exports to the Mississippi River. Use of resistant soybean varieties is a very effective strategy for managing soybean cyst nematode (SCN). Numerous SCN-resistant soybean varieties are available for Iowa soybean growers. 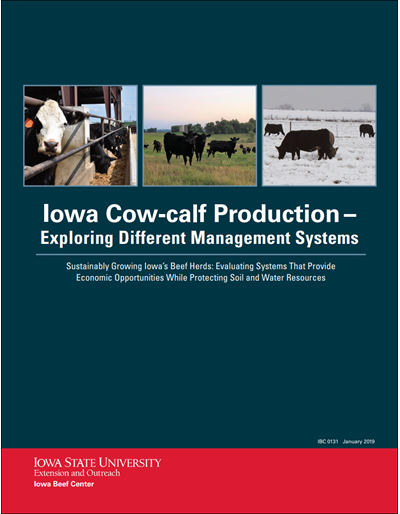 This report provides details by Iowa State University personnel who evaluate varieties each year. The risk of weeds developing resistance to a herbicide site of action is determined both by how the herbicide is used by the applicator and also by the frequency of resistance mutation in weeds. The more a site of action is relied on, the greater the risk of resistance, regardless of the frequency of resistance. Iowa Retail Initiative (IRI) Program: Equip your local independent retailers, invest in your local economy. IRI Champions workshop provides training and resources for the community and small business supporters. IRI Coaching works directly with retailers tackling the obstacles preventing business growth. IRI Snapshots trains local leaders to assess information about their retail districts, mapping, and decision-making. 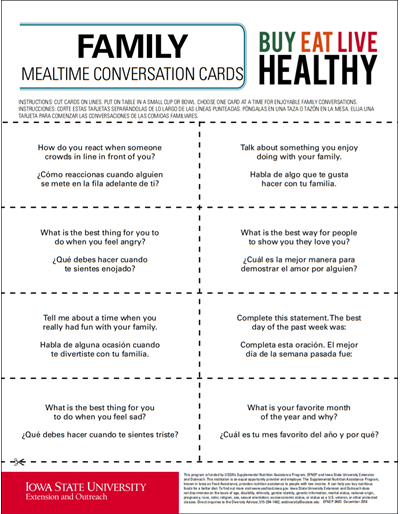 What makes your community unique, healthy, and alive? Is your community ready to create your vision to grow? Are you excited about recruiting new residents? Does your community need a focused marketing plan? 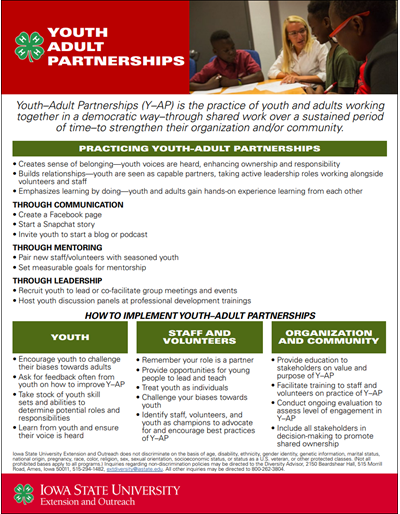 If YES, your community is ready to take ACTION! 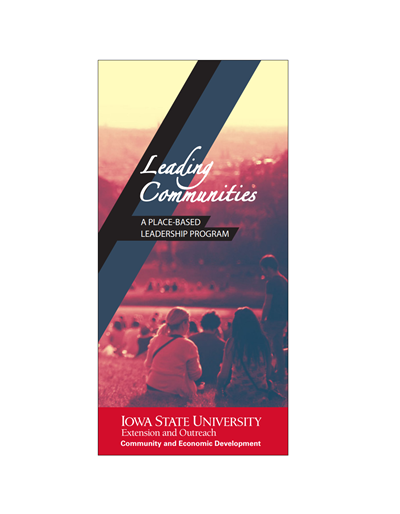 The Iowa State University Local Food Leader training program is intended to be used by beginning local food practitioners, although it is open for anyone who is interested in food systems development and collaboration. 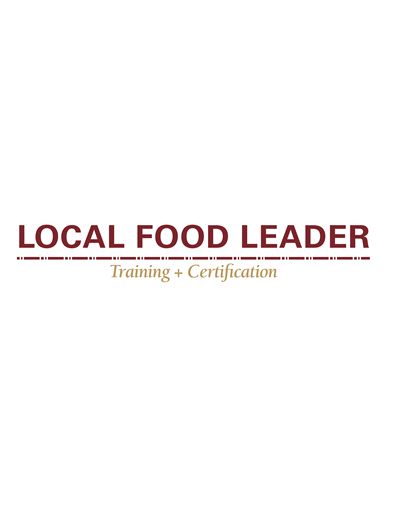 These modules will complete your certification as a Local Food Leader. The online modules offer intensive curriculum including a community food systems overview, methods of engagement and leadership, tools and resources, creating teams and tools for success, and evaluation. 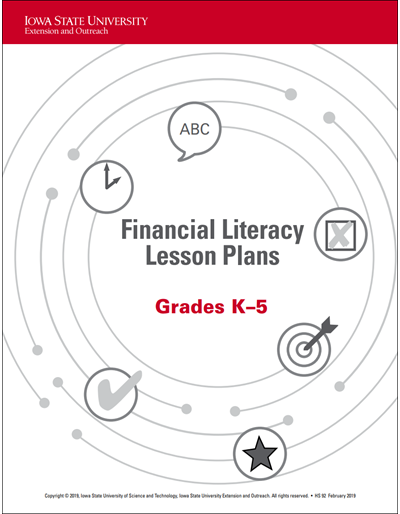 Individuals will receive a certificate of completion upon finishing the online training modules. 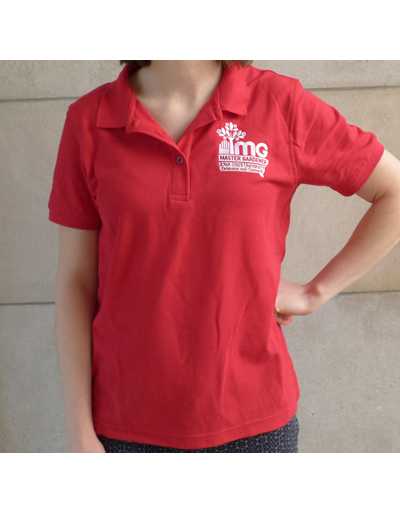 The emphasis is on comfort in a traditionally styled sport shirt; featuring the Iowa Master Gardener logo on the upper left chest. This publication explains how the federal tax laws apply to farming. 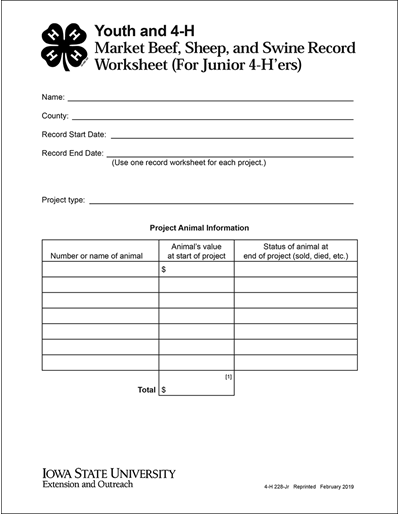 Use this publication as a guide to figure your taxes and complete your farm tax return. 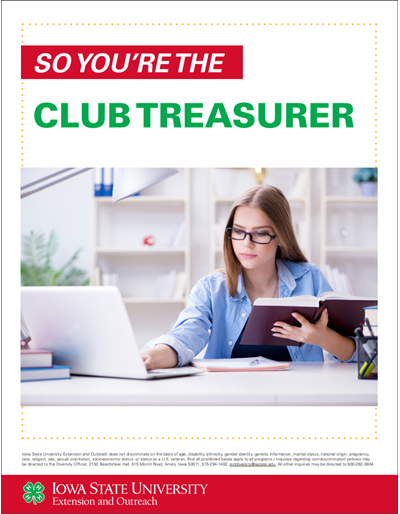 The explanations and examples in this publication reflect the Internal Revenue Service's interpretation of tax laws enacted by Congress, Treasury regulations, and court decisions. However, the information given does not cover every situation and is not intended to replace the law or change its meaning. This publication covers subjects on which a court may have made a decision more favorable to taxpayers than the interpretation of the Service. Until these differing interpretations are resolved by higher court decisions, or in some other way, this publication will continue to present the interpretation of the Service. 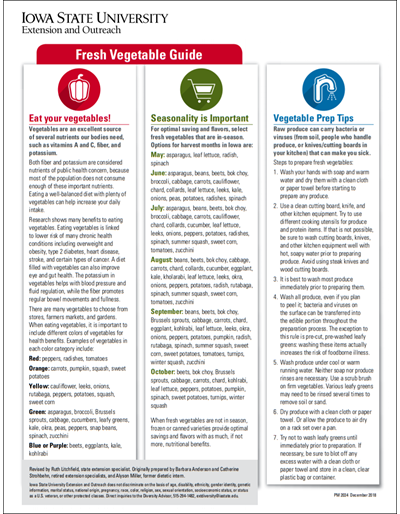 This guide offers tips on how to select, store, and prepare vegetables. 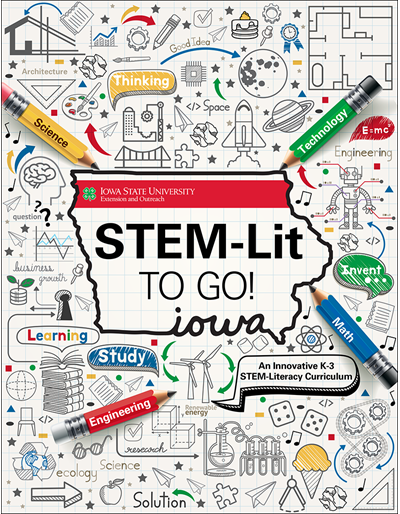 Iowa has a wealth of free geospatial resources. 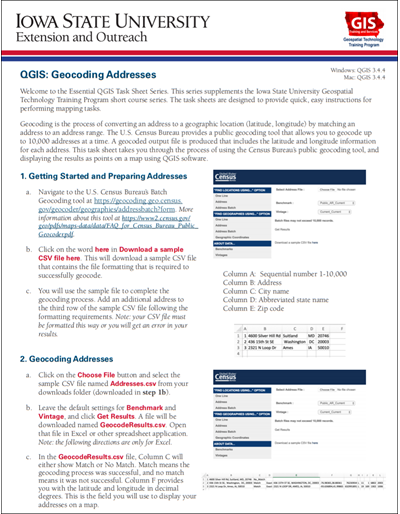 In this QGIS task sheet, we will be reviewing several different websites that offer access to free GIS data. 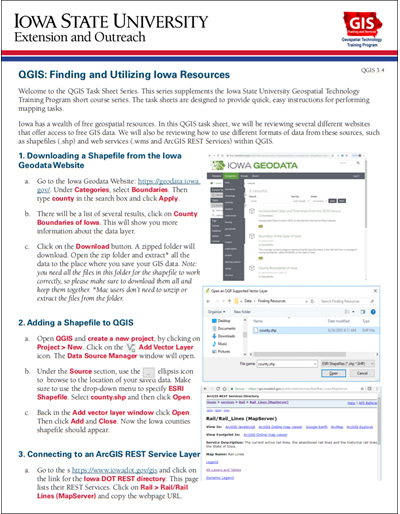 We will also be reviewing how to use different formats of data from these sources, such as shapefiles (.shp) and web services (.wms and ArcGIS REST Services) within QGIS. 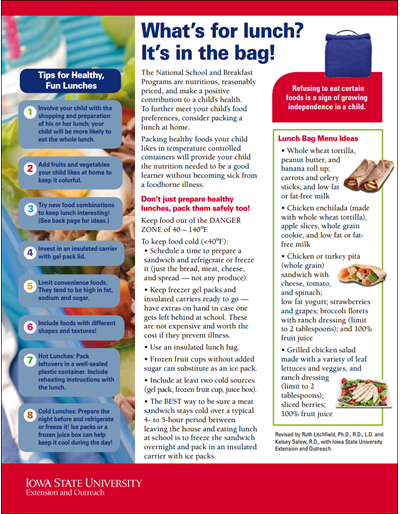 Menu ideas for kid-friendly, healthy lunches your child will want to eat and packing tips to keep foods at a safe temperature. 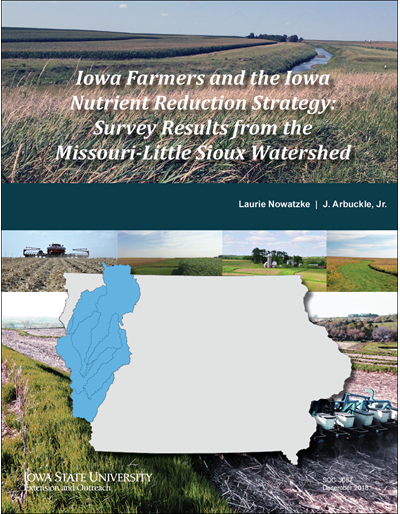 This report summarizes data on farmer awareness, attitudes, and soil and water conservation practice use related to the Iowa Nutrient Reduction Strategy (NRS) in the Missouri-Little Sioux HUC6 watershed in northwest Iowa. The report will help interested stakeholders to track progress toward NRS goals on agricultural nutrient loss reduction and better understand related barriers and challenges. Opioid use is a growing issue in both rural and urban settings in the United States. The U.S. makes up only four percent of the world population, but 27 percent of drug overdose deaths. Understanding the geographic distribution and characteristics of opioid deaths in Iowa is essential to effectively addressing this crisis. 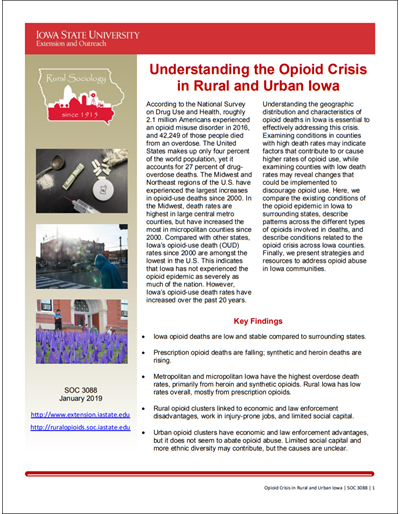 This publication compares the existing conditions of the opioid epidemic in Iowa to surrounding states, conditions related to the opioid crisis across Iowa counties and provides strategies and resources to address opioid abuse in Iowa communities. 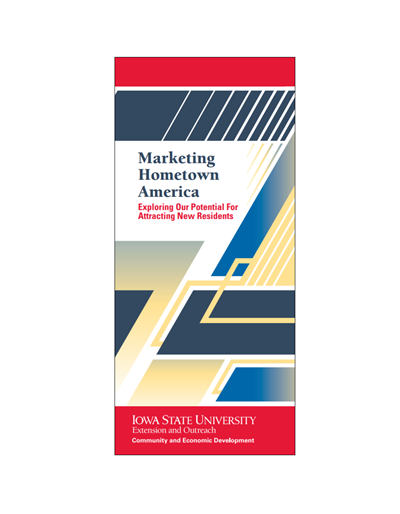 This publication summarizes current demographic, economic, and social trends in Iowa's rural, micropolitan, and metropolitan counties between 2007 and 2017. Current year data are presented along with changes from last year and five years ago for comparisons. 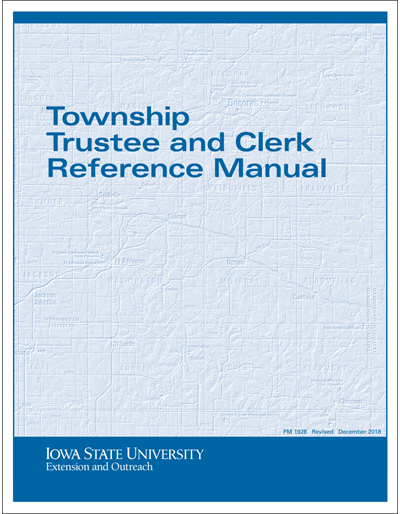 In addition, county maps are provided for local information. This publication provides a simple guide to creating a backyard box blue birds to call home. 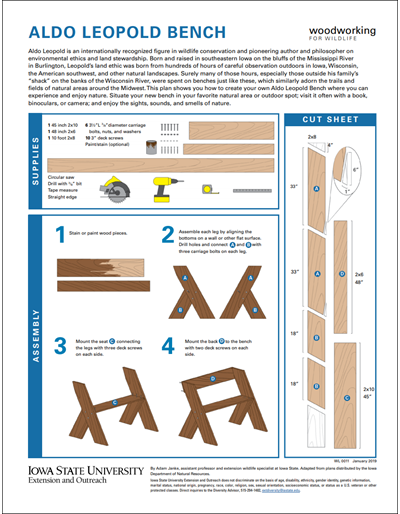 The guide provides materials needed in making the blue bird box, as well as step-by-step instructions for construction. This publication provides a simple guide to creating a home for wood ducks, emulating their natural nesting locations. The guide provides materials needed in making the wood duck box, as well as step-by-step instructions for construction.